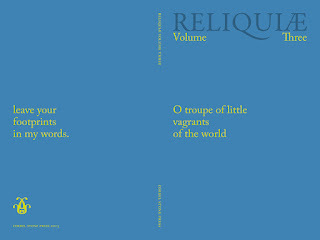 Corbel Stone Press are now taking orders for the third issue of Reliquiae, the journal of landscape and literature edited by Autumn Richardson & Richard Skelton. This finely designed and produced journal publishes prose, essays and adventurous poetic forms on the themes of myth, place, nature, fauna and folklore. The forthcoming issue includes a meditation on yellow by Scottish poet Thomas A Clark, an account of making field recordings of ravens by Chris Watson, a fragment from the Norse epic the Edda, on the world-tree Yggdrasil, by Olive Bray, Richard Skelton's elegy for the badger, esoteric poems by the Irish mystic 'AE', and much more. It will also include my previously unpublished piece 'Properties', an imagined auction list of stones, driftwood and windfalls, and lost things: and a reprint of the story 'Baltersan's Third Edition' (from Secret Europe). 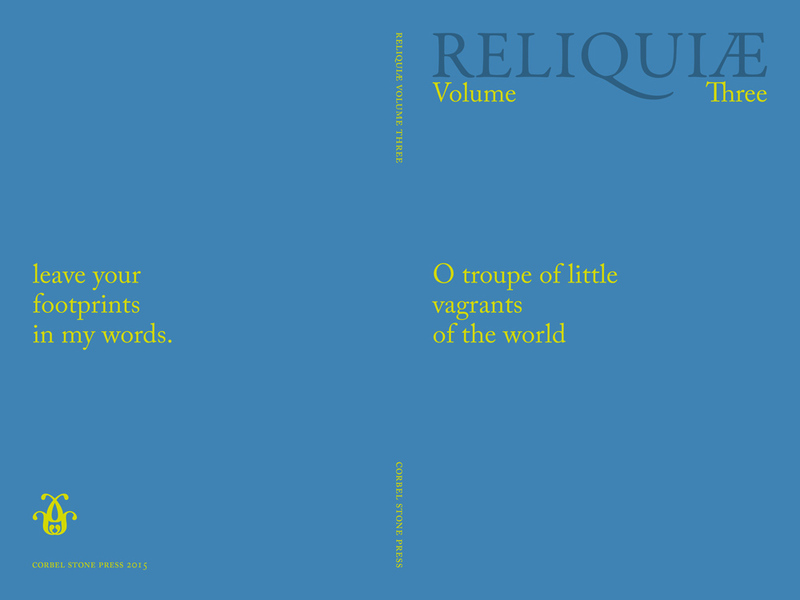 Reliquiae Volume Three will be published in November 2015, but is available to pre-order now. All customers who pre-order before October 1st will receive their name printed in the journal's 'thank you' section. Another colonial edition purchase, this time a copy of Sir Arthur Conan Doyle's A Study in Scarlet found at the Lifeline Book Fair on the weekend for $20. Green and Gibson's A Bibliography of A. Conan Doyle mention two colonial editions of A Study in Scarlet published by Ward, Lock & Bowden. The first, in blue cloth and black lettering, was published in 1892 and probably forms part of Ward, Lock's first attempt at a colonial library, which began in about 1890, with a pseudo Australian coat of arms on the back cover and 'Australian Edition' or 'Colonial Edition' stamped on the front cover. The second and more successful series, of which this copy is a part, started in 1895 and continued with the rust-coloured uniform covers and black lettering until about 1899, when the covers changed. It has 1895 printed on the title page and 'Colonial Edition' in gothic writing with a stamp on the back cover that it is for circulation in the colonies. Both colonial editions seem fairly scarce and I can't find any images online. This 1895 edition (more accurately, issue) is the 1894 sixth impression of the second edition (if I'm reading Green & Gibson correctly) with new prelims. Thanks to John Loder for the detailed bibliographic information. These two railway guides are from 1971 or thereabouts. Because that’s in my lifetime, it seems to me contemporary: but it’s over forty years ago and I have to recognise that to others it is history, just as the Thirties would have seemed to me then. They describe two of the most remote railway lines in Britain, in the far North of Scotland, giving a short history of their construction, then evoking each landmark and station. 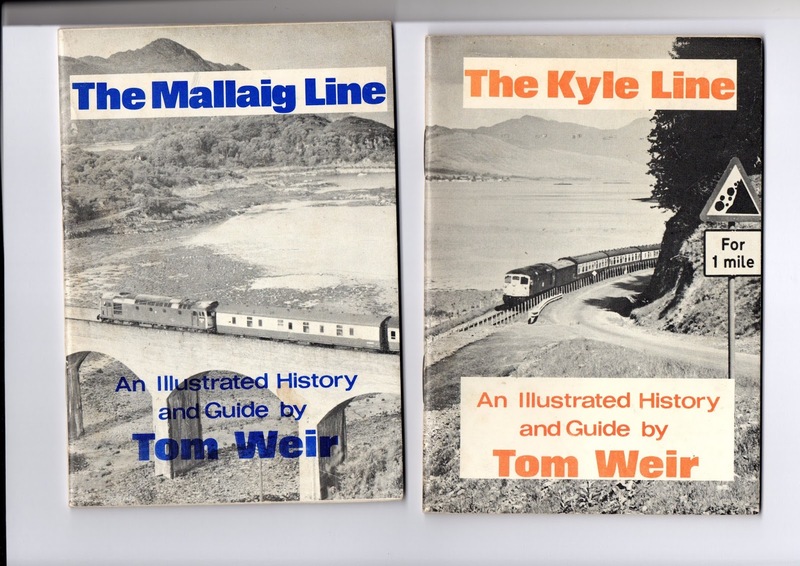 The author, Tom Weir, also took the trouble to talk to people who worked or travelled on the lines, and records their memories. They are a delight for the armchair traveller. Some landowners only permitted the railways to go over their land if a private station was built for their own estate, and some of these wayside halts continue to exist, far from any significant settlement, bare platforms in the middle of nowhere. Quite a few supernatural stories start with a character alighting at a lonely station like these. 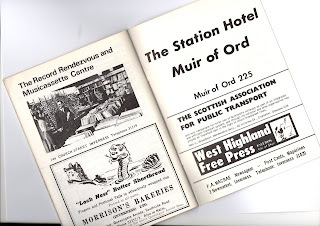 By the time Tom Weir is writing, increased motor car ownership and travel is beginning to threaten the existence of the railways (it was less than ten years since the major Beeching programme of closures). So he also takes care to explain their importance to local communities. One of the charming aspects of the guides is that they were evidently funded in part by advertisements from local tradespeople: hotels, cafes, shops. The design and wording of these has a quaint air even to me today: they are notable for simplicity and civility. But I particularly like the one for ‘The Record Rendezvous and Musicassette Centre”, Inverness. This could actually be of a shop today, except that now it would be tongue-in-cheek and be for a retro or vintage emporium. Found in the £1 barrow outside Saltaire bookshop, The Late Mr Early by Joan Hewett (1943), though not with the dustwrapper illustrated here. It’s a ghost story, if marginally. The first lines are: “Silently, effortlessly, without even pausing to open the door, the late Jonathan Early entered his library. That, he reflected, was one of the few advantages of being a spirit. . .”. There is a family tree on a preliminary page, showing his nephews and nieces. These will soon be gathered to hear the reading of his will, which contains some surprises. Complications and treacheries and a twist or two follow, and his bequests influence the lives of all the legatees, while he observes things from afar. The writing is lively, crisp, with nice descriptive touches, and the characters are well differentiated and developed. It is unashamedly commercial fiction, but done with brio and verve. A Note says: “With grateful acknowledgement to Mr A V Fraer, Barrister, of Auckland, New Zealand, who gave me my first lessons in the gentle art of Will making.” The book makes a clever appeal to the perennial fascination with wills and inheritances, a staple in mystery fiction since Victorian times, but here in a pacier modern guise. There is a discussion of the author on a genealogy site, which pieces together the following information. 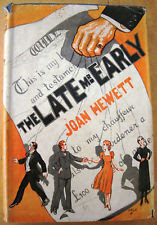 Joan Hewett was born in Middlesex in 1904 (sometimes later given as 1905). She moved to New Zealand at an early age. She married in 1923: her son was born in January of the following year; her husband died that same year. She was thus left a widow and a lone parent at the age of 20. The Late Mr Early is dedicated to “Philip and Punch”. Philip was her son, then nineteen. She remarried in 1930 and divorced in 1942. In 1947 she travelled to England and the USA to try to promote her books. She was interviewed by the Amarillo Globe and described as one of New Zealand’s leading novelists: she was trying to sell her books as films in Hollywood. She is last known of in 1956 travelling from Southampton to Quebec, when she is described as a stenographer. She gave her address then as Western Gales, Cummersdale, Carlisle. This was also the address at about this time of Osbert Wyndham Hewett, the author of Strawberry Fair, a biography of Frances, Countess Waldegrave (1956). He later went on to edit And Mr Fortescue: A Selection from the Diaries from 1851 to 1862 of Chichester Fortescue Lord Carlingford K.P. (1958), politician, the husband of Countess Waldegrave, and believed to be the model for Trollope’s Phineas Phinn. A copy of this book was offered for sale with a typed, signed letter from the author dated August 1958 about the success of this book, noting that his sister has promised to promote it in South Africa. He must evidently have been some relation of Joan Hewett and this may be an allusion to her, since as we have seen she was no stranger to publicising her own books. Her books are: A Divorce Has Been Arranged (Duckworth, 1937); Week-End Rhapsody (Duckworth, 1939); The Late Mr Early (Macdonald, 1943); Dare to Trespass (Macdonald, 1944); Frost in September (Macdonald, 1946); Nymph With A Broomstick (Macdonald, 1949); Women Are Dynamite (Herbert Jenkins, 1951). Some sound as though they may also have a fantastical element. A N L Munby is known by ghost story enthusiasts for his volume of Jamesian tributes collected in The Alabaster Hand (1949, recently reprinted by The Sundial Press). They are amongst the best of the stories in the antiquarian tradition, and were written when Munby was a prisoner-of-war during World War Two. He later went on to become the Librarian of King's College, Cambridge, and a literary scholar and essayist who always writes with a fine mingling of learning and levity. "The verses, always cheerful and clever, were partly written for camp dramatic productions, and they must have helped keep up his own and others' spirits. 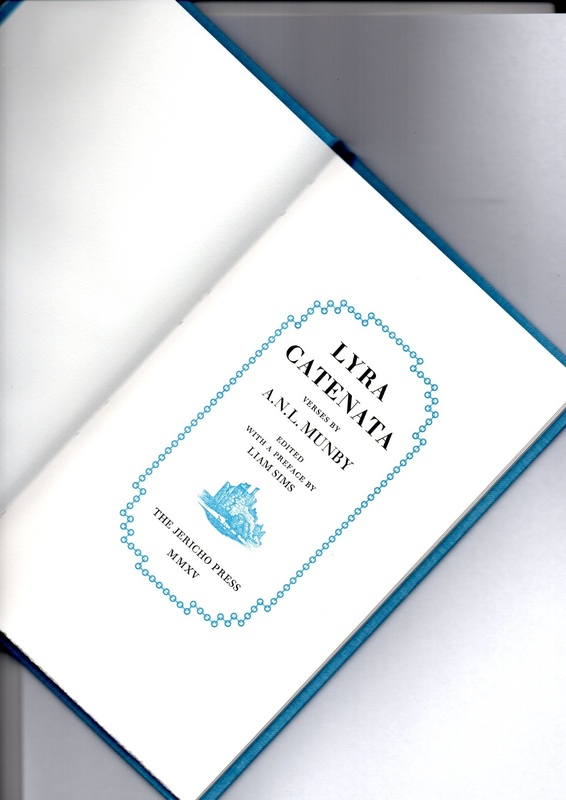 Tim published nine of his poems privately in 1948 under the title Lyra catenata, 'a chained song', in an edition of 35 copies. The present edition reprints these nine and adds two more: one from a 1947 anthology, and another ('Augustus Stokes: a cautionary tale') by kind permission of the author's son Giles Munby from among the unpublished verses in his notebooks." There is an introduction by Liam Sims and the printing and production quality of the book looks admirable. Alas, this edition itself is only of eighty copies, and it is apparently already out of print at the Press: but copies may possibly be obtainable from the bookseller James Fergusson. Enquire at: jamesfergusson[at]btinternet[dot]com. Amongst the barely considered literature of Britain is the parish magazine. These little periodicals, now perhaps largely superseded by online equivalents, typically gave the dates and times of church services, notices of forthcoming events such as fetes, homilies and other messages from the parson, appeals for funds, and other miscellaneous matter such as recipes, funny things overheard, and gardening tips, designed to season the publication with lighter reading. As a (largely) amiable record of local news and interests they present a slice of social history that ought to be preserved at least in a representative form, and I wonder whether any diligent library has undertaken this task. Moreover, it is not at all impossible that amongst them there are some unnoticed minor delights, literary, antiquarian, topographical, botanical. We know, for example, that Arthur Machen wrote the church guide for the Parish of Amersham, where he lived in semi-retirement: it is now a rare item in his bibliography. It is quite likely that other literary figures made similar contributions, signed or unsigned. By their ephemeral nature, few of these little publications will have survived, but those that do are certainly worth scrutiny. A rather unusual contemporary example is the The Hotspur, which began modestly as the parish magazine for Healey, Northumberland, a remote settlement of slightly less than two hundred souls. It has since evolved into a periodical of art, history, myth, landscape and the arcane, edited with flair by Jamie Warde-Aldam. Each (un-numbered) issue is identified and infused by a theme. 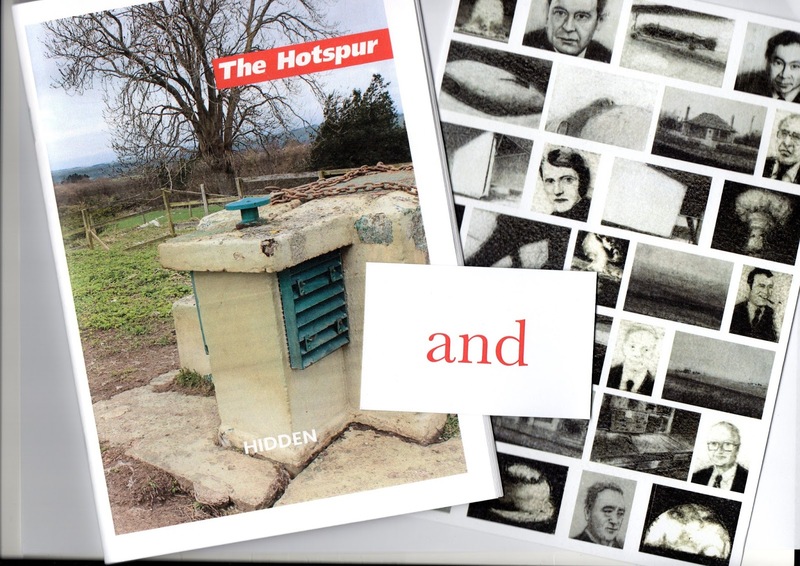 In the latest, that theme is ‘Hidden’, inspired by a disused Cold War bunker in the vicinity. Contributors explore the history of Cold War installations, the legend of St Cuthbert's Mist, a Victorian stage magic illusion, the Tiepolo frescoes in the Villa Valmarana, and a journal of local living in rural Ireland. There is also an art plate, 'The Secret Underground Bunkers Do Exist' by Michael Mulvhill, and one of the finest errata slips ever, 'and'. When they were temporarily out of favour (they are now more sought-for) I used to pick up from charity shops and so on any unusual classical music albums on long-playing records that I saw, particularly those by obscure British composers. I recently re-found among these an old LP of Phyllis Tate’s chamber suite ‘Apparitions’ (1968) for tenor, harmonica, string quartet & piano (she often used unusual combinations of voices and instruments). It is paired with ‘Roman Dream’ by the Welsh composer Alun Hoddinott, together with another piece by each of them, on Argo ZRG 691. Phyllis Tate’s work arranges four old ghostly songs: ‘The Wife of Usher’s Well’; ‘The Suffolk Miracle’; ‘The Unquiet Grave’; and ‘Unfortunate Miss Bailey’. She gives these a fresh treatment, matter-of-factly eerie, recognising that the folk or popular origins of the songs were earthy and unsentimental, yet still have a hard chilling quality. The singer Gerald English’s renditions are done with gusto, and with a goosefleshy thrill that suits the weird material. The harmonica was an inspired choice as lead instrument, for it can be both brittle and mournful, and it also has the informal, profane quality of the songs. The side is completed by ‘Three Gaelic Ballads’. Her foreword for the score of Apparitions show how she aimed to convey the stark uncanny power of the songs: “These ghost songs are performed for the most part as if through a gauze, the dynamics only occasionally rising to forte”, she noted. 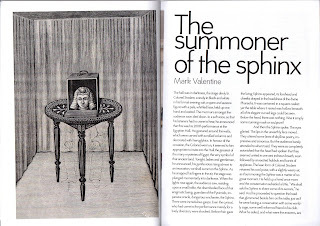 She explains the way she tries to invoke the uncanny in each one, before the ‘Envoi’, where “the natural and the supernatural meet on more equal terms”, adding, with a touch of wry humour, “finally the harmonica performs the last rites with a brief reminder of the first ballad”. The songs have had other striking renditions. ‘The Wife of Usher’s Well’ received a lively but still eldritch electronic performance by folk-rock maestros Steeleye Span, while the medievalist rock group Gryphon did a beautifully melancholy version of ‘The Unquiet Grave’, complete with crumhorn solo. The composer’s work includes a sufficient number of other pieces with a spectral or macabre theme to suggest that this dimension held a certain fascination for her. These include ‘The Lady of Shalott’ (1956), for tenor and instruments, ‘Witches and Spells’ (1959), a choral suite, ‘Dark Pilgrimage’ (1963), a television opera, and ‘Gravestones’ (1966), a vocal score composed for singer Cleo Laine, as well as other folk song arrangements and nocturnes. Phyllis Tate (1911-87) herself seems to have been a colourful and redoubtable individual with trenchant views and a zest for the unobvious. 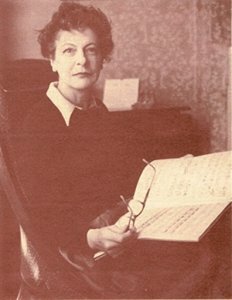 Born in Gerrard’s Cross, Buckinghamshire, she had to combat the prevailing prejudices about women composers, and about her own unusual and modernistic music. Withal, she seems to have been diffident; when the leading woman composer Dame Ethel Smyth praised her work, she was pleased: but noted that of course the eminent lady was by then quite deaf. She amusingly noted that when Dame Ethel came to support a performances of a piece by her, she sat in the front row, stamping her umbrella “to what she imagined to be the tempo” of the work. Phyllis Tate said she hoped her work would endure, but added it was not for the composer to say. There is probably scope for more discussion about the influence of folk songs with supernatural themes on British classical music, and also of those composers who used such themes in their work. Certainly the links with fantastic literature are there: John Ireland was a keen enthusiast of the work of Arthur Machen, Peter Warlock influenced the work of Mary Butts, Armstrong Gibbs set songs by Walter de la Mare to music. It would be interesting to hear of any monograph or study that looks into this. 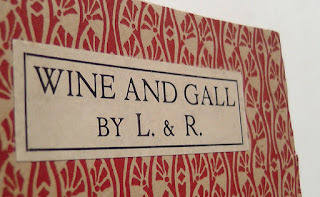 Some years ago I found a copy of a book of poems called Wine and Gall, whose authors were given only as ‘L’ and ‘R’: and each poem was attributed to one of these initials. 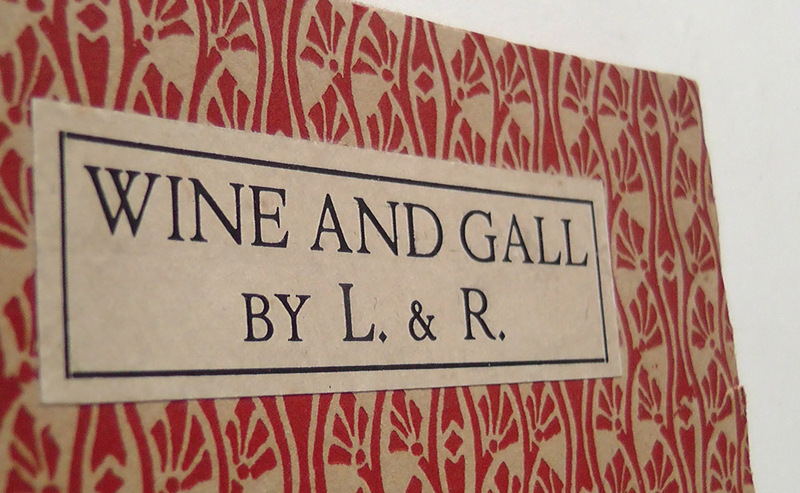 It was published in 1918 by Basil Blackwell in Arts & Crafts style covers with a crimson pattern. 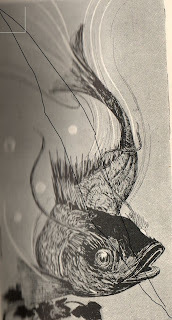 This copy had been mutilated: some of the pages were cut out. The book had interesting associations. 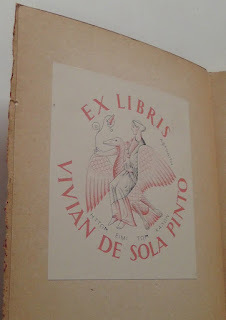 On the inside cover was the bookplate of Vivian de Sola Pinto, friend and second-in-command to Siegfried Sassoon in the Great War, and himself a poet, essayist and literary critic. 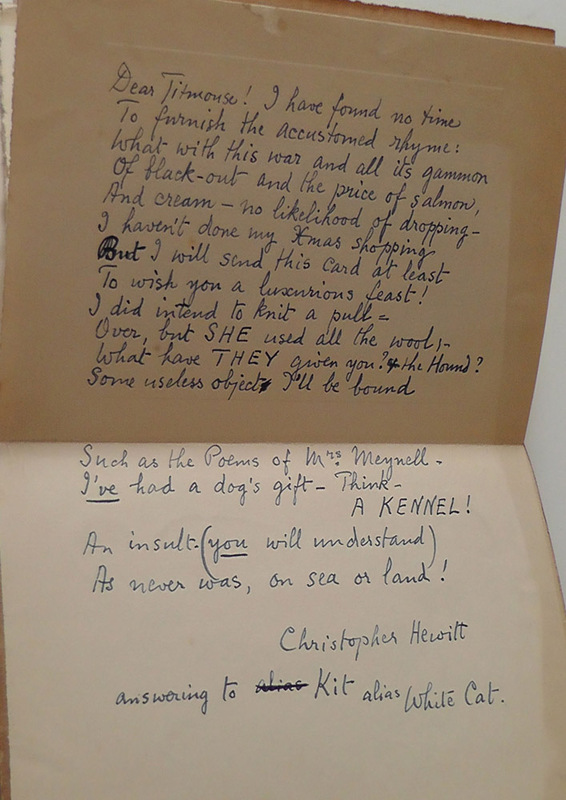 Pasted into the back was a card with a picture of a black cat, the handwritten message ‘Good Luck!’ and inside a manuscript verse sent for Christmas, written as if by a white cat called Kit, but signed ‘Christopher Hewitt’. The poems are lovers’ verses to their amours, tinged with the imagery and fervour of the Neo-Decadents – those youthful writers who discovered and tried to emulate the fated figures of the Eighteen Nineties, in Edwardian times and after. The volume had a one line notice by John Rodker in the modernist magazine The Egoist No 4 Vol VI (September 1919): “relies on cheap antitheses rather mellifluous”. This was part of a column of reviews of a handful of the publisher’s recent issues, headed “Blackwelliana”, and generally scoffing in tone. The reviewer ‘E.M.’ in The New Age (No 1443, New Series Vol XXVII, No 1, May 6, 1920) gave L and R more space, but was also unenthusiastic. He begins: “The authors would have been well advised not to mix their drinks. The wine is light and piquant, but the gall would not sell even in a prohibited country. “L” purveys the former, and “R” the latter.” The first, he says, is “obviously influenced by Heine” but the poignancy is “verbal, not real”; “one of the perils of mere cleverness, which has not its roots in reality”. However, it is grudgingly admitted that a few lines (of the loved one’s image stamped on the heart “As on a coin the conqueror’s head”), “have what appears to be an original image, and hence an original feeling”. “R” comes in for greater scorn: “why the verses of “R” should appear in the volume is a mystery”: “the thinnest of gall…in spite of its being copiously mingled with blood”. There are very few clues as to the identity of authors. But one of the torn out poems in my copy, ‘Item Persicum’ by ‘R’, has the lines: ‘And the truest poet I ever knew, /Whose roses grew in the Syrian dew,/Lies dead at Davos Platz.’ This is a reference to James Elroy Flecker, who served as a Vice-Consul in Beirut (then in Ottoman Syria), and died in 1915 of consumption, in Davos. In this poem ‘R’ is himself marching “on the Persian road” in the army, one of the few specific personal details we are given. ‘R’ could have known Flecker as an undergraduate at Oxford, where he was notorious for his fervid verses and boisterous behaviour. Alternatively, he might have encountered him in the Middle East while both were stationed there, the one in the Levant Consular Service, the other in the forces. Another of the torn out poems, ‘Aegrotat’, by ‘L’, has a startling Great War metaphor: ‘It hurts my eyes to look in yours, /And like a splintered shell /Their dark beam in the brain endures,- /Ah how can I be well ?’, suggesting that this poet too was or had been away at war. Who ‘L and ‘R’ were, and why they published together, which must surely imply some close friendship or affinity, remains a mystery. Their verses have a certain sardonic polish and, if they are not quite distinctive enough to really force the reader’s admiration, they are sufficiently odd and out of the usual run of things to merit some attention. Possibly their authorship was known amongst a certain circle of friends in Bloomsburyish and Oxford regions. The addressee and the author of the manuscript poem are likewise lost. 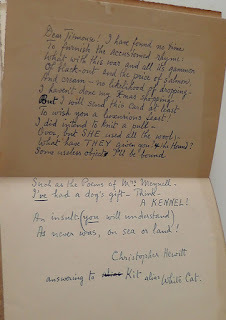 But the final mystery is why certain poems were excised from the copy I found - were they kept when the book was discarded, or discarded while the book was kept? (With thanks to R B Russell for the photographs). After the energy and earthiness of the earlier satirical illustrators (Rowlandson, Gilpin, Hogarth), Victorian illustration became mostly demure, with the fantastic and grotesque found chiefly in books of children’s fairy tales. 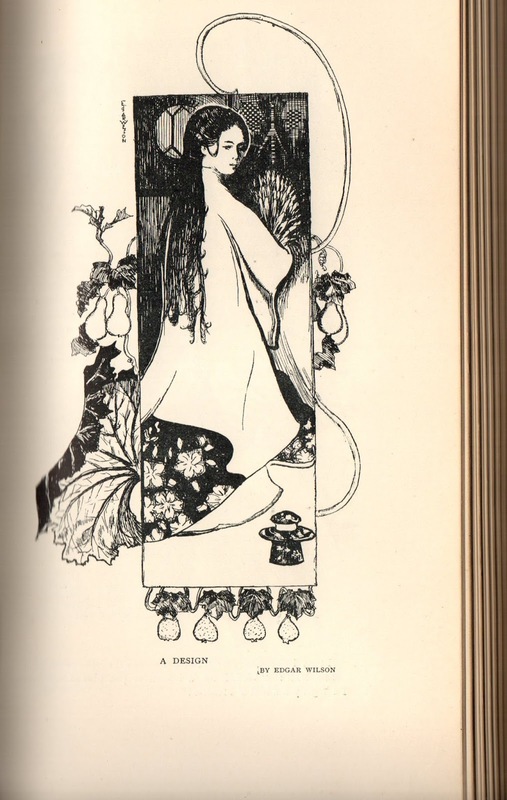 It took the genius of Aubrey Beardsley to revive the art, with his boldness both of line, and of theme: and his angular figure leans over all the black and white drawings of the late 19th century like an audacious lamppost. It is hard for other artists to stand out under his light. But one of these who was almost as highly thought of at the time was Edgar Wilson (1861-1918), who drew mostly for the lively and comic periodicals (The Butterfly, The Idler, Pick Me Up – their titles convey their frivolous contents) but is now completely overlooked. “To the most casual student of Mr. Wilson's work it will be obvious that he has been strongly influenced by Japanese art. There is probably no designer in England who is more learned than he in the productions of the great masters of Japan. It is precisely the reality and profundity of Mr. Wilson's knowledge which prevent him from making imitations of Japanese drawings. Many a designer, in the excitement born of his introduction to the colour-prints of Hokusai, Otamaro, and the rest, has given us occidental adaptations of them…. "Mr. Wilson sees things with his own eyes; and records what he sees in his own manner. His etchings are among the very best which are being produced by the younger Englishmen of the day, and their popularity can only be a question of time. To me it is a surprising thing that people should buy reproductive etchings of pictures, when for the same money they can have original ones which artistically are of far higher value…. “As a book decorator, Mr. Wilson takes a very high place, and it is a remarkable thing that no publisher has secured his services for the entire production of an elaborate volume. Perhaps his work is best seen in the pages of The Butterfly. The failure of this little publication to obtain the support of the comparatively limited audience to which it appealed is, from the point of view of art, one of the most disappointing things of which I know. The literary contents were admirable, and when we remember that the artists included, besides Edgar Wilson, such men as Joseph Pennell, Raven Hill, Maurice, Greiffenhagen, O. Eckhardt, Paul Renouard , E. J. Sullivan, S. H. Sime, and J. F. Sullivan, its failure is somewhat inexplicable. "For The Butterfly was a bazaar of smiling and alluring fancies. It is obvious that it stood no chance of appealing to that vast army of magazine buyers who delight in portraits of celebrities at various periods of their life, in personal articles written by ladies of title for the bourgeoisie, and in big instalments of portentously long serials by the authors of such masterpieces of fiction as The Sorrows of Satan and The Christian. “Still The Butterfly really should have found five thousand righteous persons willing to achieve its salvation by spending sixpence a month on it. To The Butterfly, Mr. Wilson contributed not a few of his most delightful drawings. Not less important than these are the decorations with which he made scores of its pages distinguished. It is the air of distinction about Mr. Wilson's work which is especially welcome…. For many reasons is the file of The Butterfly a desirable possession; by no means the least of these is the brilliant series of head and tail pieces with which Mr. Wilson has adorned it. Fortunately some of the best of his work of this kind may be seen from time to time in the pages of The Pall Mall Magazine, but the scope for his gift is of necessity narrower in that publication than in The Butterfly. Lafcadio Hearn mentions Wilson in his essay 'About Faces in Japanese Art' which cites a paper given by the connoisseur Edward F Strange to the Japan Society: "He tried to explain the nature of the advantage likely to be gained in the art of book illustration from the careful study of Japanese methods; and he indicated the influence of those methods in the work of such artists as Aubrey Beardsley, Edgar Wilson, Steinlen, Ibels, Whistler...". And indeed Strange, in his study The Colour-Prints of Hiroshige (1925) confirms Wilson’s devotion to Japanese art in his acknowledgements: "I would pay a tribute to the work of other students of the subject, and particularly to the late Edgar Wilson and to Mr. Arthur Morrison, who shared my early investigations into the question...". One of the few recent mentions of Edgar Wilson's work occurs in Simon Houfe's Fin de Siecle, The illustrators of the Nineties (1992). In discussing The Butterfly he says: "But what captures the imagination is the work of Edgar Wilson, a marvellous decorative artist whose head and tailpieces (aptly named because they are often of fish) reveal an unending power of invention in a broadly Japanese idiom." There seems to be very little biographical information about Wilson, other than his dates and the fact that he mixed with the other artists illustrating for the periodicals. The two illustrations here are from a bound volume of The Butterfly, and have not reproduced well, but give some hint of Edgar Wilson's exotic and elusive work.